There are so many things that I love to do, more than chores. But some days chores are just so unavoidable. I have issues with sitting down to read or play a game when my surroundings are messy. Perhaps that’s part of the reason why I love The Sims so much. They walk into a room and if its decor or cleanliness doesn’t meet their standards the Sim’s mood begins to decline. I am the same way. So when my room is a mess, games cannot be played to their full enjoyment potential. I spent this morning and early-mid afternoon cleaning my room. Now I feel super accomplished and ready to play. Is there anything you just have to do before you can sit and relax? Forgive me readers, It’s been 4 days since my last post…..
Yeah OK, enough of that. I feel like I have had the craziest 3 weeks that have ever come to pass within my current life’s span… can any of you relate? My brother was home for 2, we literally lived at my moms for 2 weeks. As much as I adore my family, and I LOVED spending time with a brother I haven’t seen in 2 years. I was glad when we got to go home. Honestly, I missed my bed. Had we been able to bring our bed with us I do believe we would have fared much better. There is rumor that my brother will return in about a week without the girlfriend. I have high hopes. Sometimes girlfriends just complicate the family visit. Regardless of how sweet they are it’s hard to really be yourself around someone who is new. I hope to actually take some photos. we’ll see how that goes. I did manage to spend a few fleeting moments of quality time with my Sims. I missed them while I was gone. 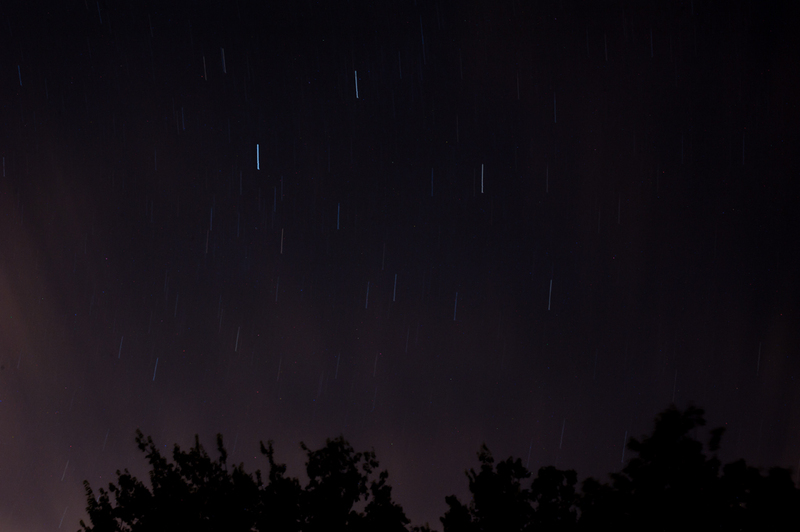 I believe my biggest accomplishment these past weeks was I managed to get a star trail picture before the clouds covered. I have been desperately wanting to try, but there is way too much city light where we live. So I tried it out at my mom’s. Not perfect, but not too shabby for a very first attempt. I really do love the night sky and all it has to offer. It’s truly amazing!! Side Note: Have any of you read the Kitty Norville series by Carrie Vaughn? I am curious what your thoughts may be on these books? Did you like them? Why? Didn’t Like them? Why not? Friday nights have become something of a bittersweet time for me. It is a night when I can do whatever I please, but I generally do so alone. I despise being home alone. However this one night a week gives my Nerd and I some time apart to do things we enjoy. The end result is generally a pleasant one. My Nerd ventures into the Nerd kingdom to the comic/card store on Friday nights to play Magic the Gathering with all of his Nerd kingdom buddies. It gives him the opportunity to spend time away from home and doing something he enjoys, without our little mini-nerds asking for something every 5 minutes. Honestly I really enjoy going with him when I can. I don’t play. That is something I do with him alone to avoid as much mockery as possible, but I truly enjoy going out there. It is nice to be around my Nerd while he is in his element. I also like to watch the games unfold and a lot of the guys over there are fun and very witty. Good times are had. • Occupy myself while the minis eventually fall asleep. • Take a LUSH bath. • Play The Sims 3 until my Nerd comes home. Currently I am at the end phase of #3 on that list. I cannot WAIT for them to pass out so I can fix myself a yummy drink and run my LUSH bath and read a book for a couple hours. Ladies – though it’s a little pricey, really it’s worth the money. So after my bath I’m going to play with my Sims. They had download purchases on sale the other day so my Nerd bought me the Supernatural and Generations expansions for a total of $17. It totally made my rotten day better. Just like when he brought me LUSH home yesterday!! I made myself a werewolf family and they now have 4 little werewolves of their own running around and another on the way!! I am trying to decide which supernatural species to create next! Next thing I know I am going to have my town overrun with supernatural creatures in no time at all! I know, I’m 31 I should get a real life rather than live vicariously though my little Sim People. At least that’s what my old man tells me. But how am I supposed to do that? At this moment I have zero werewolves in my life. Uhg. Oh well, some people really just don’t get it! And really? That’s ok.
Now I do believe it has been a while Since I last heard Transformers clicking their parts in place as they are making their grand transformations from cars to awesome robots and back again! So I am going to make myself a drink, run a bath and grab a book. Y’all have a fabulous night!